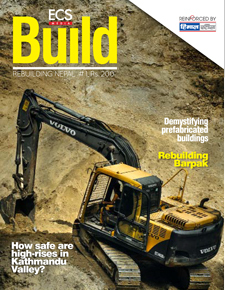 Build is a construction magazine. It is a special project of ECS Media Pvt. Ltd, that was started right after the devastating Earthquake flattened around six lakh houses in various parts of the country. As these houses needed to be rebuilt, we came up with the idea of Build, as part of our contribution to the society. To provide information on building safer and stronger structures in both rural and urban areas using various alternative and sustainable technologies. Architects, engineers, builders, material suppliers, international community, government and everyone involved in rebuilding process. Experts opinions on the most debatable topics like high-rises in Kathmandu Valley, traditional vs. modern technology, restoration of temples and monuments, retrofitting and upgrading houses, soil testing and many other aspects of construction.